Eugene Goostman is a 13 year old boy… or, at least, that’s what a number of people in a test at the Royal Society in central London believed. In fact Eugene Goostman is an artificial intelligence programme which managed to pass the controversial Turing Test by convincing over 30% per cent of the judges that it was human. This is the first time a computer has convinced enough people to pass the test in the 65 years since its inception. The Artificial Intelligence was developed specifically to imitate a 13 year old boy, using techniques such as Natural Language Processing, in an effort to make his personality and knowledge level believable to test subjects. The Turing test is named after the legendary Alan Turing, who helped shorten the Second World War and save many thousands of lives with his critical work at Britain’s code-breaking centre at Bletchley Park. 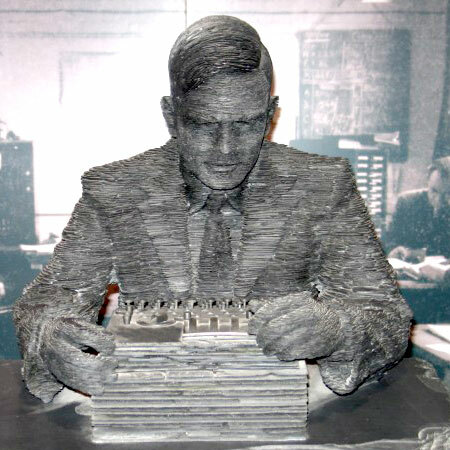 Turing suggested that, in order for a computer to be indistinguishable from a human, it would have to be capable of thought. The Turing Test is open to interpretation and different tests have different criteria, ranging from computer programmes that aim to convincingly imitate human behaviour to those that attempt to achieve abstract thought. Contrary to an earlier, made-up report by us, Eugene Goostman was not programmed to be sullen, unresponsive and refuse to tidy its room while playing World of Warcraft on the internet in order to make it appear like a 13 year old boy. The New York Times reported that Hector Levesque, a University of Toronto computer scientist , presented a paper at the premier international conference on artificial intelligence in 2013, arguing that many working in the field of Aritifical Intelligence have forgotten about the intelligence part of artificial intelligence in favour of mimicry. He suggests that, while Siri and Google’s voice searches may be able to understand a sentence like “What’s on at the cinema tonight?” they can’t begin to understand questions like “Can an alligator run the hundred-metre hurdles?” that nobody has heard before. Any ordinary adult can think through an answer because a human can work out that alligators can’t hurdle but, if you type the question into Google (and other Search Engines), you get results about Florida Gators track and field. Eugene Goostman probably wouldn’t get it either. For decades, programmers have been using the Turing Test as a benchmark of technology despite its shortcomings.